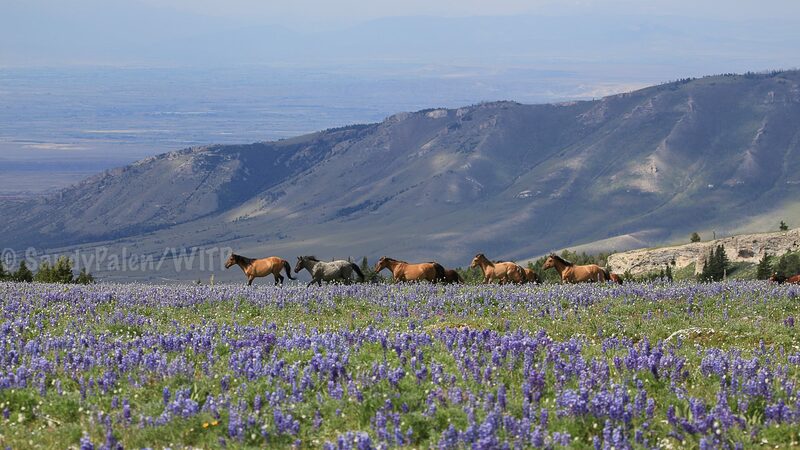 It is a tragedy that the weight of carrying on the wild horses is put on these young fillies. Not just here but other herd areas as well. As a society, we have allowed a terrible transgression against the wild horse societies. But when will we accept this? I think the horses in some part have noticed that the older mares aren’t fertile or foaling every year so they turn to the younger ones like they can sense there is a problem and they adjust in order to pass their genes, combined with the fact that the mares were darted later than usual and we have this result. I don’t know if i should be excited or not with the outcome because i can’t help but thinking the upcoming removal, perhaps the BLM will find it as an excuse to remove more than neccessary and in any case young mothers and foals are in danger. Quintana might be Mescalero’s only offsprings but he is Flin’t full brother so some of his genes must already passed on not to mention that Fedspar has three offsprings with Cloud on the range and one more with Flint. Ireland has many offsprings too. I realise most the cases are circumstancials since Firestorm was also very fertile but she has the approrpiate amount of offsprings on range, in any case i fear that genetic diversity and representation is already affected greatly. Wondering how many more births are we going to see, and will the mares who are off the drug be one of the new mothers this year or the fillies will take over? Thank you for your comment. I’m not sure how or if I should respond to your reasoning at Mescalero and Blue Moon’s offspring.. But I feel I do need to..If the thought pattern went that way, we would have to do the same for other full sibblings on the range.. and that would not be good. I mean, just because my sister has kids, does that mean I shouldn’t have my own representation? I don’t think so. I think every horse on the range should be allowed to have at least 1-2 offspring. But I will agree, Feldspar definitely has enough offspring on the range, but removing her only offspring with Mescalero is not the answer. Unfortunately trying to count a horse’s representation by including offspring of siblings has led to bad removal decisions in the past. I think Quintana should have the chance to remain to represent Mescalero even though Feldspar currently has 5 offspring on the range (and remember Pride is eligible for removal as well.) A group of us has worked very hard in discussions to hopefully get the BLM to consider paternity in management decisions and removal choices. If a stallion only has 1 offspring that offspring should remain even if they are out of a dam that is well represented. Another thing is that while we are artificially managing these horses we need to keep in mind how natural management works. Mares that are naturally very fertile and strong mothers would have more surviving offspring on the range than other mares. Mares like Feldspar, Firestorm, Washakie, Greta, Ireland, Pheonix, etc. They are more reproductively successful so they have more surviving offspring. Same goes for successful stallions. As artificial managers we are trying to make sure everyone has adequate representation but that doesn’t always add up to equal representation. Feldspar has more offspring on the range than many other horses because she has produced more offspring than many of the other horses. Allowing Mescalero to have representation and simultaneously allowing another offspring for Feldspar does not hurt the genetic diversity of the herd. But not allowing Mescalero to have representation because his only offspring is also a Feldspar offspring would. Also something to remember looking at Feldspar’s “5” offspring. Only 3 of them are safe from removal. Pride and Quintana are both eligible for removal and could potentially both be taken bringing Feldspar down to 3 offspring. I know we are hoping they don’t take both, but that is a possibility that could happen. The 3 mares that were most likely to be removed from the range all had foals. The most logical solution would be to remove Pride from the range to leave his half sister but Pride is the last foal of Cloud and many people ask that it remains in pryors … even if I would like , that it remains unequal. The number of horses that was going to be removed this year is totally nonsensical, if there are two descendants for each mare only Quivra, Pegasus Quillian Quaid Pride Prima can be removed but their father need them for genetics and now 3 of his mares have foals. I depart a little from the subject! I do not see anymore the interest of removing horses from the range. To be frank, if one of Feldspar’s offspring has to go I’d prefer it to be Pride over Quintana. He already has two full siblings on the range and both Feldspar and Cloud are very well represented. Objectively it really doesn’t make any sense for him to remain at the expense of another young horse whose bloodlines aren’t as well represented. On the subject of the new foal, he’s a very cute baby and I see he’s inherited the Starman blaze. I always had a soft spot for Starman so I’m glad to see a nod to him with this colt’s name. I wonder who Stargazer’s sire is. I sure hope it isn’t Mescalero. Sorry I wrote Quivra !